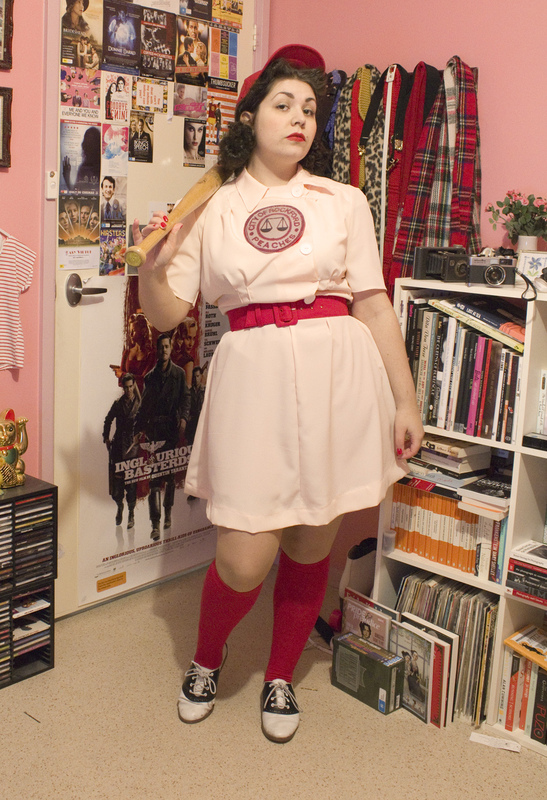 In the past, I've had a couple of emails from people asking me how I made my Rockford Peaches costume. Well, since I've got costumes on the mind, right now, I thought I'd do a post with some tips on how I made mine. Obviously, as it was made a few years ago, I don't have progress shots and I should warn that I know very little about sewing so the descriptions of how things were done may be vague. Hopefully it'll still be helpful! Below is the pattern that I used. And by 'I' I mean 'we' and by that I really mean my mum. Ha. I just really hate sewing but I like trying to figure out how I can alter patterns to my needs (which is a bit more difficult when you don't know much about sewing terms and whatnot). Basically, what I suggested was to extend the front panel so it came across like the uniforms did and to shorten the length. Does that make sense? (The extending bit, I mean). I believe it was basically done just by cutting straight across from the pattern piece for the front until it seemed wide/long enough. It doesn't look exactly like the uniform but it's a decent approximation and it meant I didn't have to buy another pattern. The buttons on the panel are just for show and the dress actually does up with press studs/snaps. Any similar pattern would work just as well. The buttons on my dress are solid white but they're a little more pearly in the film. Next was finding the right fabric. This was probably the hardest part. The uniforms are probably a cotton drill or something similar to that - they would have to be a sturdy fabric, anyway, for what the players would be putting them through. However, I just couldn't find a fabric similar to this in the right colour so I ended up getting some kind of matte satiny fabric instead. At least, I thought, it's the right colour! And I had, and still don't have, any plans to actually play baseball in this so it's not too much of a disaster. Because it's not a shiny fabric from a disntace it looks fine. The second hardest aspect was finding a plain red baseball cap. You'd think it would be easy but it was impossible so we just covered the logo of a cap with red fabric and put an 'R' patch over it (or perhaps we attached the 'R' to the fabric and then glued it onto the hat). I don't have any good photos of the hat but you can see a phone shot in my original post on the costume. The movie hats had an 'R' in a circle (which you can see in the top picture) but the original Rockford Peaches uniforms had just a white 'R'. The hair is easy - I wanted mine to look like Mae's so I set it with a middle part and pinned the fronts so I could have the little peaks like her hair did but any '40s styled hair that will fit under a hat would work. As you can probably see the 'patch' on the front of my dress was just printed onto paper and sewn on. I think there may have been official embroidered patches at the time, but I can't quite remember. At any rate, there aren't any now! I was running low on time so we just found a decent sized image of one online and printed it out. I believe I didn't have enough money to buy some transfer paper or else I would have transferred it onto fabric. If I wear this again, I will probably do that next time! Someone else did a pretty good job of making their own patch. The belt isn't screen accurate (it has a covered buckle instead of the plain metal one) but it's very close and I had it on hand. Just traced over a large '5' that I'd printed out, cut it out of some red fabric and it was sewn onto the back. I don't remember which pattern was used for the shorts but any red shorts would do the trick! 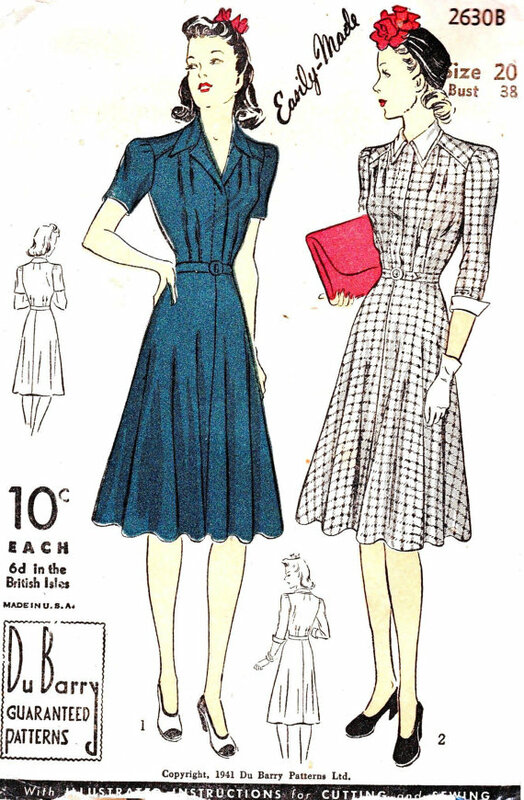 I think we used something from Wearing History but I haven't found any shorts patterns that sit nicely on me. These weren't going to be seen, though, so it didn't really matter. I think the shorts might be satin in the film or for the official uniforms, though. For shoes, I just wore saddle shoes. I didn't want to fork out the money for proper baseball shoes and these were the closest I had. Plus they do look pretty cute with the costume! 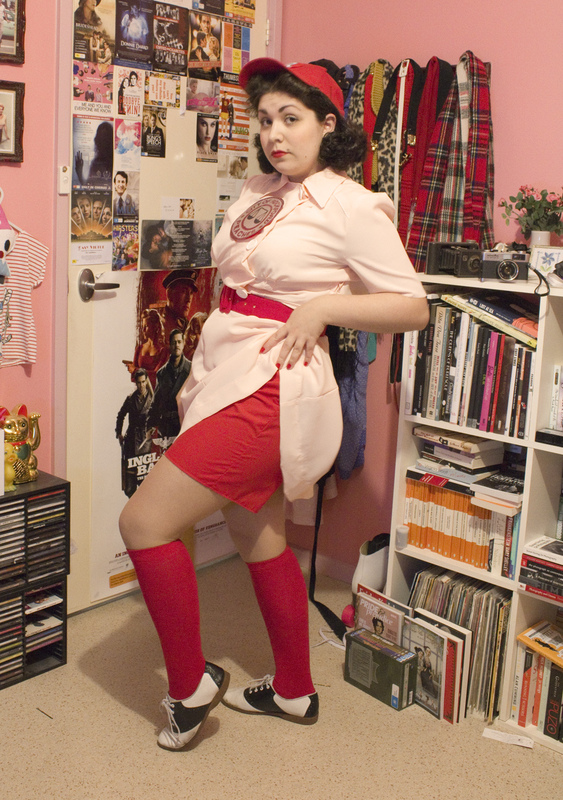 To be honest, if I wore this again I'd consider remaking the entire thing, mainly because of the fabric. The fabric I got is the right colour but not the right kind (but in the time frame I was working in, it was all I could get - it's not that easy to find good fabric, here. I've been running around trying to find some for another costume but just can't find something that's quite right). I'd put belt loops on so it was more like the uniform worn in the film. I'm not sure if I'd put the AAGPBL arm patch on as it was an anachronism but I'd definitely get a proper patch for the front of the uniform. But I'm still really proud of this (even though I didn't make it entirely myself) and it was one of the first times I'd ever created a costume that was from a movie or had a specific reference. A bat! Or a catcher's mit. Hopefully this post has been helpful even without any in progress shots! If anyone would like to see anything else like this in the future, just let me know. (I've also been asked how I did the Roswell costume before). And if it's all too much for you, you can buy officially licensed uniforms here! They also have some on Amazon that aren't particulary accurate but still cute. Let me know what you think of the post or if there is anything I should have added that I either didn't think of or forgot. I love this costume on you. I wish I had a desire to still play dress ups. I have become and old grump. i still cant even deal with how perfect it is! you are fabulous! Still, by FAR, one of my favourite EVER costumes. I bow before you, my fellow A League of Their Own loving gal. Seriously, I am in awe of this incredible uniform/costume and wish I had even a modicum of sewing talent so as to follow you and your (super talented) mom's lead (ALOTO is one of my absolute favourite movies ever - I've probably seen it 50 times over the years). Still just the coolest costume ever!!!!!! Ahhhhh I love it so much, definitely one of my all-time faves of your costumes, which is saying a lot because you have theeee coolest costumes! this is so fun. well done. 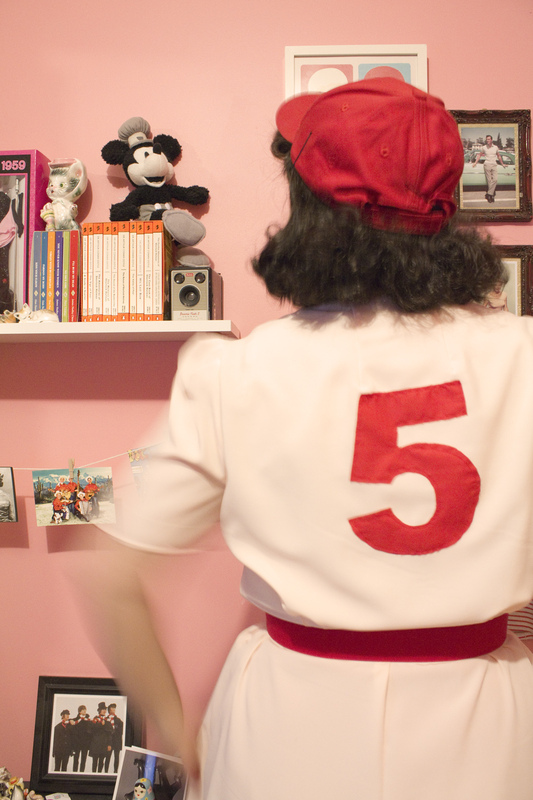 you look perfect as a rockford peach. This is so amazing! I love the movie and your costume is just perfect, and you look wonderful in it. I love your instagram but never thought of looking up your blog until now, even though I know I've seen it before. You wouldn't happen to have any blog or instagram tips of others who are into Barbie and 80s toys and such? Gosh, I can't think of any, sadly but now I want to find some more. If I find anyone I will let you know! I do follow a lady on Instagram who collects (all eras) My Little Pony if that interests you? Any chance you still have a link to or saved copy of the image of your front "patch"? I'm hoping to do the same thing. Thanks! Hi, I don't think I do, sorry. Someone was meant to send me their printable version but never did. I think if you do a google search and sort by image size you should find something. There is also an etsy store selling an embroidery pattern for a machine. Thanks for this blog. I just made my daughter the outfit for Halloween. 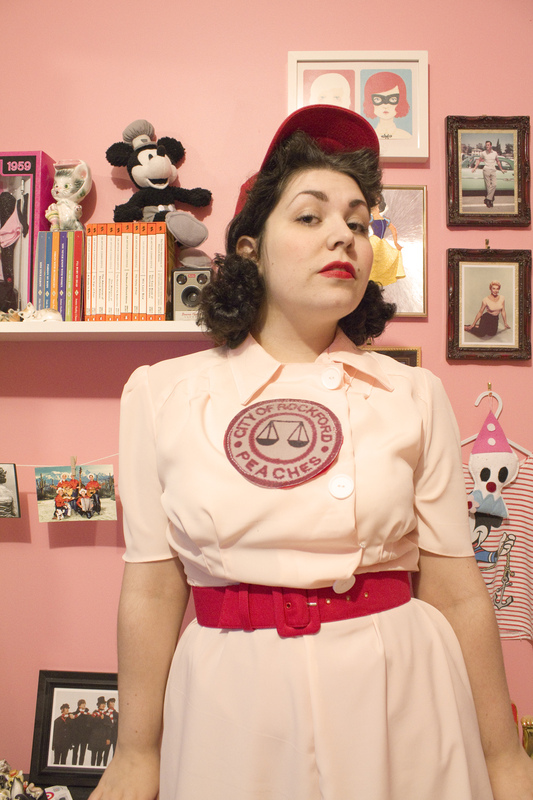 I made it as a two piece: a 50s blouse pattern which i adjusted and an a line skirt. I think it looks pretty good and hope my daughter likes is. Again this really helped me. Thank you. How much fabric did you get? I'm trying to make these costumes for me and my friend but I am a terrible newbie at this stuff.